Danielle Sered explaining why the U.S. needs to move away from carceral punishment at TED NYC 2017. 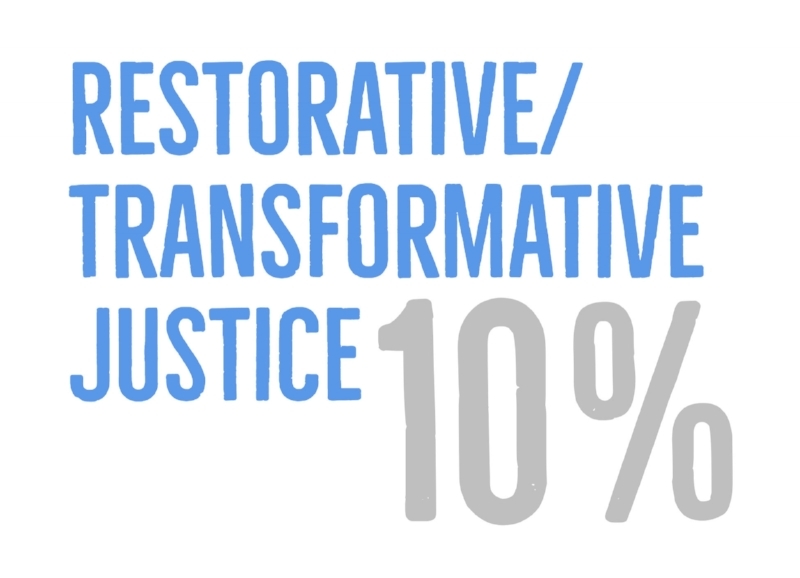 1 - What's your position on implementing a restorative justice program in Suffolk County? 1, 2, 3, 4 - N/A Candidate did not answer questions by deadline. (-1.5) Candidate does not specifically commit to restorative justice programs. 1 - I have yet to propose any such plan. When the plan is completed, it will be released to the public. I do fully commit to criminal prosecution only after considering less-invasive restorative alternatives. 2 - I intend to seek more funding for my budget than DA Conley has sought in the past. If we have to do a reduction in staff in order to fund these programs, we will absolutely consider that. The Gang Unit will be the first place I look, as 3 of the 12 ADAs in the Unit are currently on approved leave to run the Greg Henning Campaign. Greg has been on leave since March 1, 2018. How many black and brown men do we think have received continuances based on a lack of staffing in the office? Further, the Gang Unit reports up to the Crime Bureau Division, who’s chief just left to head up the BPD Legal Department. I am told from many CPCS lawyers that all of the cases handled within these units are stagnant right now. This is our current justice system at work. Completely unacceptable. 4 - I will be vocal about the fact that failure is part of success. And remind people in the media that we are committed to the success of the programs and will continue using them because they work. This type of commitment requires a strong and proven leader that can stand firm, even when the position might be unpopular. I am that person. No further information needed from candidate in this section. ^Candidate received an equity adjustment of +.25 because the Suffolk County DA’s Office has historically excluded women from key leadership roles. "I am a black woman. My brothers are black men. No matter what neighborhood we live in, we are disproportionately impacted by the criminal justice system. I was born in Boston and have lived in Boston (Dorchester, Mission Hill, JP and Roxbury). My parents dedicated 60 years combined to Boston Public Schools and in that time worked in over 30 different schools. Further, for the 20 years that I have been a lawyer, I have worked in Suffolk County as well as dedicated my personal time to Suffolk County and the communities most impacted by the racial disparities in the criminal justice system (MBLA, NAACP, AG Committee, JNC). When I am elected DA, I will be bringing my entire family into Suffolk County. It should be noted, unlike the two white democratic candidates in the race that have the financial luxury to loan themselves $10k to start their campaigns, I had to raise every dollar in my campaign. Accordingly, will live in the Suffolk County neighborhood where I can afford the rent or afford to purchase a permanent home." "I commit to continuing my plight to restore justice to the criminal system and to have racial and gender equity throughout the criminal justice system. If I do not win the primary and there are affordable housing options for me to continue living within Suffolk County, I will absolutely stay. If there are not, I -- like many other black people in Boston -- cannot afford to stay. I am responsible for my daughter and my two nieces. My responsibilities are bigger than this questionnaire." (-.25) According to the Bureau of Justice Statistics, African American women are the group of women most disproportionately targeted by the criminal justice system, but at a rate far less than African American men. As one of two African American women candidates, Rachael Rollins is tied for the second most standing. Candidate received a higher grade than equally situated candidates because the criminal justice system has directely impacted immediate family members. *^Candidate received an equity adjustment of +.5 because there is a well-documented, persistent racial wealth gap in Massachusetts. Both white candidates in this race utilized this gap to their advantage by loaning their campaigns founding $10,000 donations. (-2.25) As of July 2, Linda Champion ranks 5th out of 5 candidates in money raised, and 5th out of 5 candidates in cash on hand. (-1) As of July 2, Rachael Rollins is 3rd out of 5 candidates in money raised, and 2rd out of 5 candidates in cash on hand. ^Candidate received an equity adjustment of +.5 because there is a well-documented, persistent racial wealth gap in Massachusetts. Both white candidates in this race utilized this gap to their advantage by loaning their campaigns founding $10,000 donations.